In most cases, books are admittedly better than the movies they serve as a basis for. But can the same be said about music adaptations? What about all those cases where novels and poems become a chief source of inspiration for great composers, leading to the creation of some of their most stunning and everlasting masterpieces? I remember reading Pushkin’s verse novel Eugene Onegin when I was still in highschool, my teenage mind trying to reconstruct the novel’s theatrical setting and visualize its vivid characters. I would picture Onegin as a proud, fine-looking dandy kindly rejecting the love and pure feelings of young Tatyana, a landowner’s charming and shy daughter of introspective nature. Furthermore, I would try to follow how a silly quarrel could end with the fatal duel between Onegin and his good friend Lensky and how, finally, Onegin’s feelings for Tatyana would change when they would meet again many years later, their roles now having been reversed. 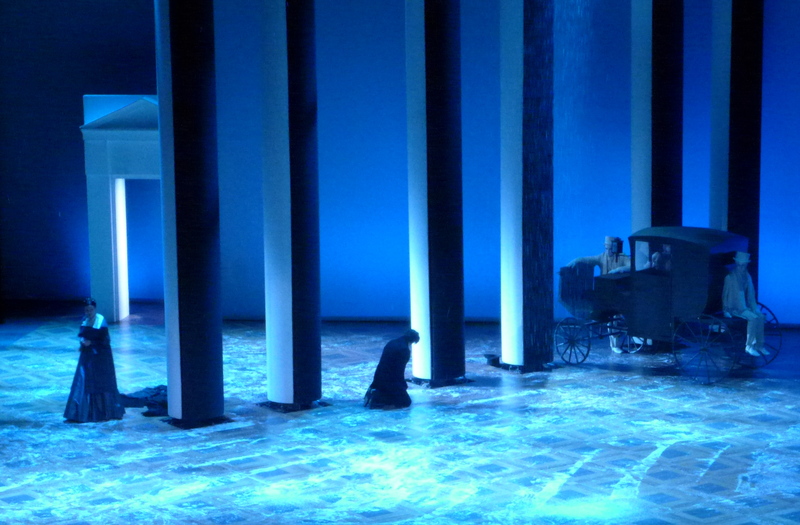 These fading images and scarce recollections of Pushkin’s novel came back to me recently, after watching Tchaikovsky’s Eugene Onegin performed by the Stanislavski Opera at the Royal Theater Carré in Amsterdam. I’ve never been a big opera enthusiast, but works such as this always make me think of the considerably powerful effect opera can have when performed convincingly and given the right context. In the case of Eugene Onegin, Tchaikovsky’s beautiful music adds a whole new dimension to the familiar story, and it feels as if Pushkin’s masterpiece has been translated into a universal language that brings out its very essence, making it accessible to anyone with enough sensitivity and eagerness to partake in the dramatic events happening on stage. Let not love be love in vain! Love refused be Love return’d. In Tchaikovsky’s Eugene Onegin, it is the sheer magic and moving power of music that serves as a substitute for such divine intervention, bringing thus consolation and a much-needed catharsis to the agony of the audience. This entry was posted in Various and tagged literature, love, opera, Tchaikovsky on February 8, 2013 by The Muser.